Police say James Altman of Portland was 'driving too fast' when he lost control of Space Age truck. 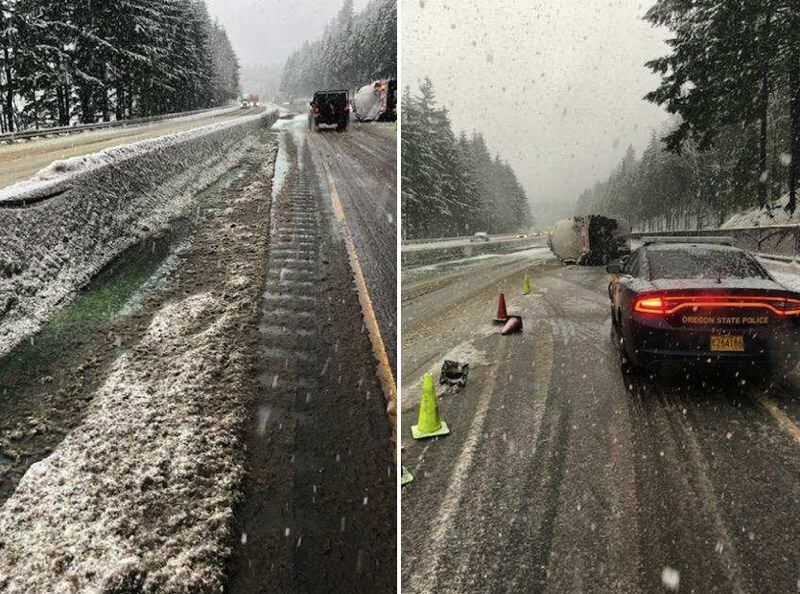 A speedster in the snow lost control on Interstate 84, police say, spilling thousands of gallons of diesel onto the highway. Oregon State Police troopers responded to the non-injury crash around 10:30 a.m. on Monday, Feb. 11, around milepost 54 of eastbound I-84. Authorities say the driver for Space Age gas stations — 34-year-old Portland resident James Altman — was "driving too fast for the snowy conditions" and lost control, sending two tankers filled with diesel fuel tumbling onto their sides. The crash leaked about 2,500 gallons of diesel onto the road. "The diesel eventually seeped underneath the barrier onto the westbound lanes of travel," according to a news release. "Two tanks completely spilled their diesel." Police say Space Age has hired a contractor to clean up the spill. The semi-truck has been towed.